Into this breach step Swar Systems (www.swarsystems.com), a Swiss company who specialise in Indian music software. 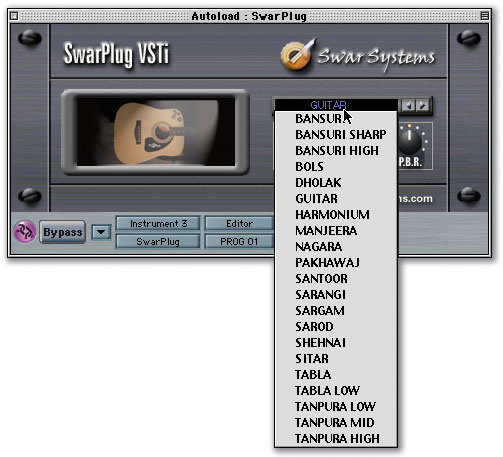 Their Swarshala 3 Pro/Swarplug bundle can provide not only Indian instruments in VST Instrument form (Swarplug) but also teach you about Indian music and provide a virtual Indian backing band for you to practise with (Swarshala). For those who prefer to use a hardware sampler, Swartrax packages the same sample library in Akai format, but includes the MIDI files and Librarian application, which are important components of the product. For those who don't want to stretch to the full Pro version of Swarshala, Swar Systems also offer the cut-down Standard version. This is limited to three instruments — tabla, harmonium and tanpura — and lacks the Compose section and piano-roll view, plus the ability to export in Wave or MIDI file formats. 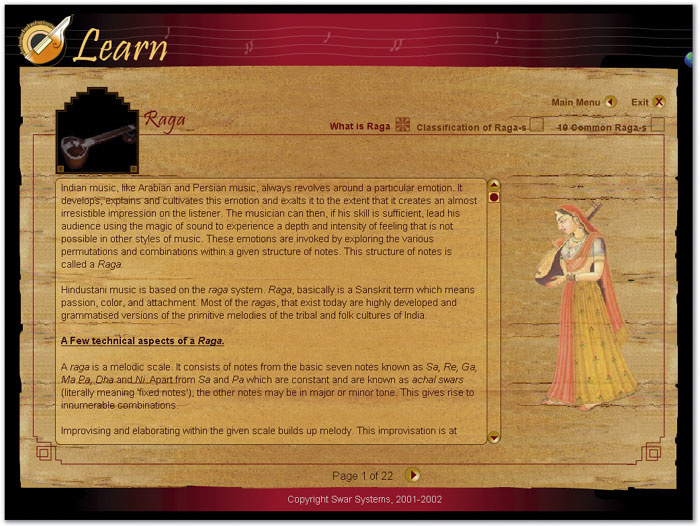 In the Raga subsection the melodic basis of Indian music is explained. Many examples are presented to listen to, in both aroha (ascending) and arova (descending) form. A couple are also presented with improvisations within the raga, as you may hear them in performance. These samples are quite long and since they're of a singer, it's easy to couple the notes they're singing (which are in the Indian do-re-mi form) with Western equivalents. This makes it far easier to translate into your own playing, on whatever instrument you use. On the shorter samples, it's worth pointing out that each note in the raga displayed is clickable — I had quite a bit of fun building up my own chords from clicking around here. I wouldn't be at all surprised if someone based an entire track just around this learning function! The Tala subsection is probably my favourite in the Learn section. Here, the essence of Indian rhythmic accompaniment is explained, again in clear, concise detail with many accompanying examples. This, of course, is the joy of interactive media — as you read about the subject, you can also hear it come to life. And with any music, hearing is understanding. I love the way the bols are presented in both voice and tabla form so you can immediately hear the correspondence between the two. The section where the tabla are presented alongside beautifully animated clickable explanations of the different strikes is simply stunning. There's a level of detail here that I haven't seen in any other interactive explanation of Indian music. The Practice section of Swarshala sets up a virtual Indian group for you. You're presented with three different panes, one for the Rhythmic element, one for Melodic and one for Tanpura (the drone element). Each pane has controls specific to its purpose: the Rhythmic pane lets you select cycle type, the Melodic part lets you select instrument and composition and the Tanpura part lets you select string order and style. All the instruments have a volume control and stop/start buttons. At the bottom of the panes is the part definition section which holds global elements like scale, duration of the whole piece and initial tempo. The best part of this section is the option to increase tempo every n cycles by a chosen percentage. This brings the practice session to life, mimicking the tempo increases in live classical music that build to the climax of a piece. It's possible to define three different Parts — which, confusingly, actually means three different types of practice, each with their own settings. 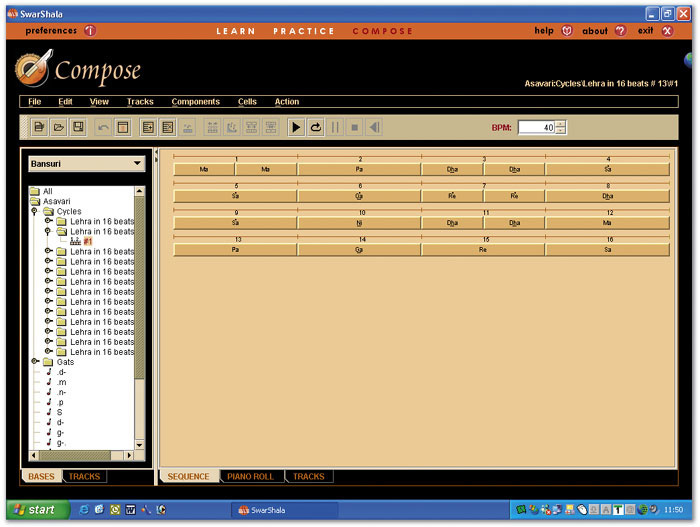 Swarshala's Compose pane allows you to construct your own compositions by piecing together MIDI loops. These can be examined more closely in the piano-roll view. I did notice a few quirks in the Practice section. Firstly, anytime you change a parameter, the whole lot comes to a sudden halt. Say you're tinkering with a session, its tempo is building nicely, and you think 'How would this sound with a santoor instead of a harmonium?' You click the drop-down selector in the Melodic section — but instead of changing instrument, the whole session stops. Not only that but you have to re-select composition, which is a pain in the bum if you forgot what you'd left it set on. Similarly, any changes you make in the volume of a pane aren't heard in real time: you have to stop the whole lot and start again. This limits the real-time tweakability. 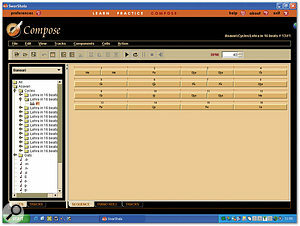 Another puzzler is the drop-down selector for Raag in the Melodic pane. Firstly, it should really be labelled Raga to be consistent with the rest of Swarshala (yes, I know that it means Raga but it adds confusion for novices). Secondly, when I first tried it, it didn't appear to do anything — the only raga choice was 'All'. Fortunately, I checked the FAQ in the manual and discovered that you can load any raga you wish within the Compose section and then it becomes available in the Practice section. Hey presto! Yaman, Asavari are all there to play with in the Practice pane. The Compose section is a simple pattern arranger; there are no facilities here for you to hit Record and then twiddle in your own majesty. Instead, you create a new composition, create specific tracks for different instruments and then add what Swar call 'components' to these tracks by using the component selector on the left whilst in Track view mode. Using tabla as an example, you'd create a tabla track in a new composition and then drag and drop tabla components from the left. By right-clicking, you can resize these phrases — in effect, time-stretching or compressing them — or repeat them. 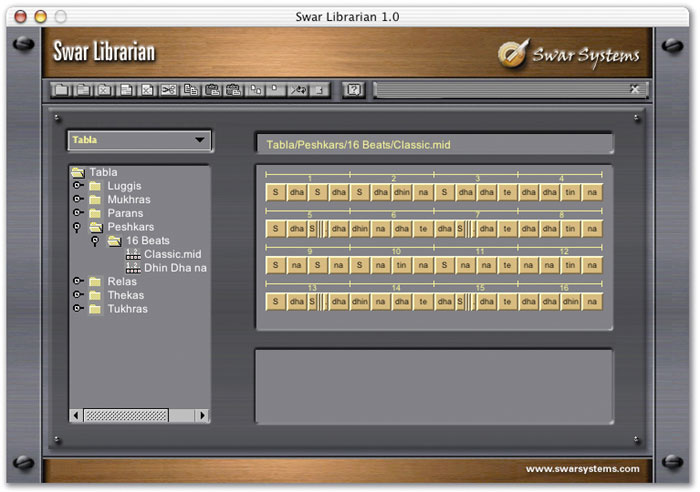 Swarshala Pro 3 also comes with a little application called Swar Sampler. Ostensibly, this is to enable you to play those lush Swar samples from the outside world (or inside, via another sequencer). I say ostensibly because I simply couldn't get it to work — it kept crashing Windows so, beleaguered, I gave up... thank goodness for Swarplug! 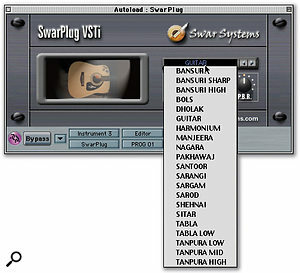 The Swarplug VST Instrument itself is a simple plug-in with only three controls.I started with the bansuri (flute). Yep, it sounded as good as in Swarshala, breathier than Western flute but with more body and roundness than pan pipes. Next, the santoor (hammered dulcimer). This instrument excelled. I immediately started trying to play Ghulam Ali riffs but, unfortunately, I sucked. Which is a shame since the santoor is one of my favourite instruments, an import into Indian music with a rich history (www.santoor.com/ santoory.html). I defy anyone to play this preset and not be inspired by the timbre of the instrument. It will lead you instantly into John Barry territory. Included in the samples are two vocal-based instruments: bols and sargam. The first is the spoken notes representing hits that you may have heard when an Indian singer is duelling with a tabla player. The second is the Indian do-re-mi being sung. I'm not sure how much use I'd find for the latter instrument but the bols are eminently usable in a rhythmic context — just think of it as Indian beatboxing. Each Swarplug instrument comes with a comprehensive library of MIDI file loops, which can be previewed and auditioned in the Swar Librarian application, then loaded into your sequencer. The interface looks a bit like the left-hand pane of Swarshala in the Compose section and that's because it serves partly the same function. You select your instrument from the top left drop-down menu and then choose an element from the folders below. 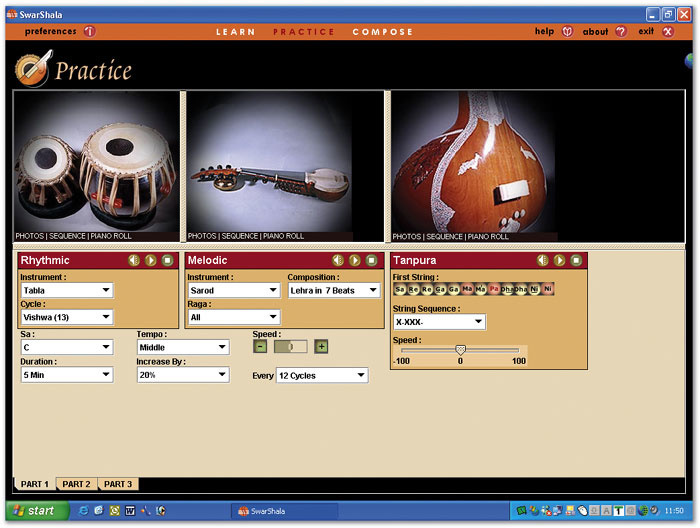 For the melodic instruments you may get subfolders for different Ragas and for the percussion instruments, different taals. Double-click on the clip you fancy and it's loaded in the right-hand pane, revealed in detail. I do have a few niggles with certain elements of Swarshala and Swarplug. The Practice pane could benefit from being a bit less stop-start — more real-time controls please! And I'm sure it won't just be me who's confused by the loading system in the Compose pane. Perhaps, being extremely picky, some of the instruments could have benefited from a few more multisamples. I'd rather lose the sargam and gain some extra sitar or santoor. And how about a Mac version of Swarshala and an OS 9 version of Librarian?